Over the last month there is one word that has been consistently plastered all over tech sites across the Internet. iPhone. 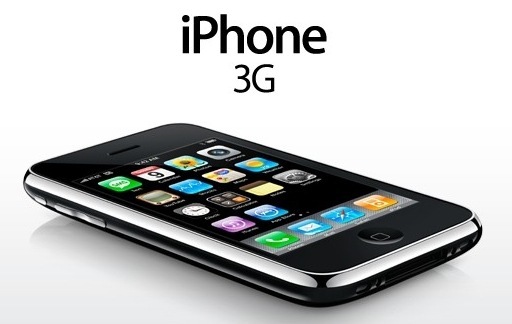 If you haven’t heard anything about the iPhone 3G yet I think we need to either check your pulse or take some dynamite to that rock you have been living under. 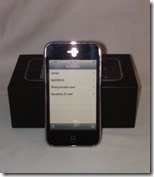 The iPhone 3G is the much heralded next generation version of the original iPhone that was launched around 1 year ago. 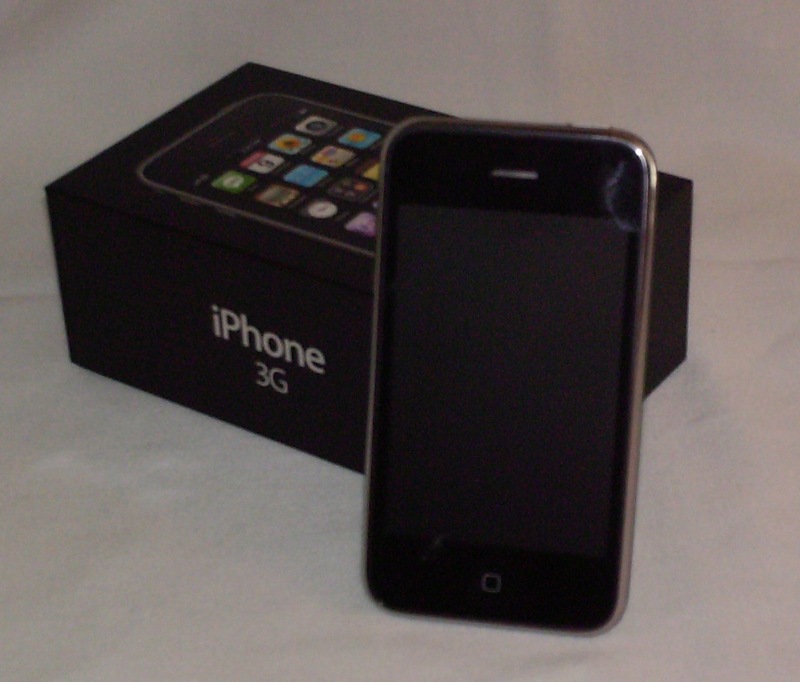 After many hours of window shopping on the web and in the Apple Store I took the plunge today and purchased an iPhone 3G. It’s been an absolute BLAST so I thought I would share the experience with you. The day started pretty early. 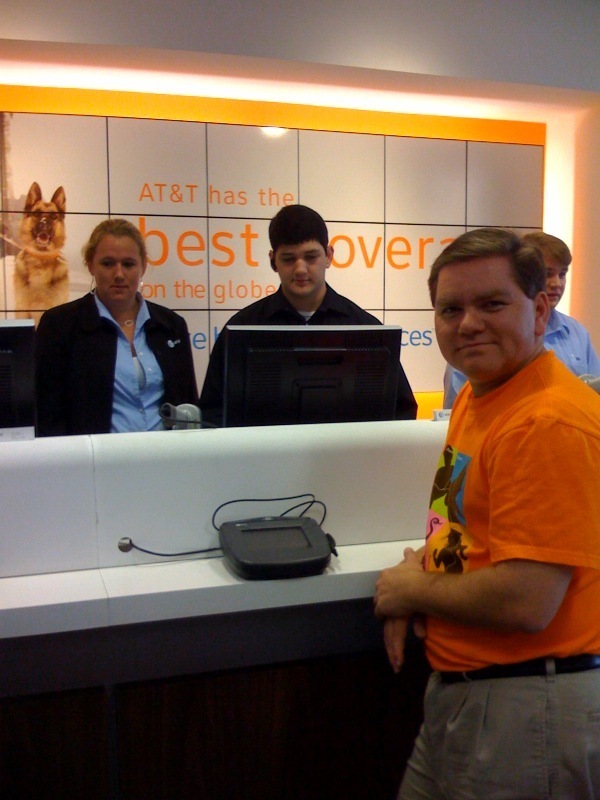 I left the house with a 30 minute drive this morning ahead of me to the AT&T store in Huntsville. 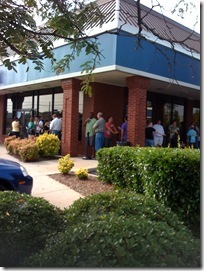 I arrived at the store around 6:55am which was slightly more than two hours ahead of the time the store opened. I had no idea what to expect when I showed up but was pleased to find that there were only a handful of people in line ahead of me. Cool beans!! Around 8:30am word starts to make it through the crowd that this store did not get very many phones in yesterday’s shipment and that no 16GB models were available today. Three out of the 4 guys around me in line were really wanting the 16GB model vs. the 8GB model. Since I was around 9th in line (I think) I figured I was in pretty good shape to get one. As nine o’clock approaches my wife and kids show up. We thought we would make a day of it and involve the whole family. Also of key importance was the fact that my wife’s iPhone needed to be there for my purchase. Here’s why…. Last October my wife got an iPhone and I got a Samsung BlackJack. The primary reason I didn’t get an iPhone as well was due to the lack of support for Microsoft Exchange. (Which is of course now included with the 2.0 software update.) One of the stipulations to get the iPhone for $199 was that you were either eligible for a phone upgrade (which I was NOT) or that you owned an original iPhone (Which my wife did). My wife (thank you dear!) pretty much gave up her upgrade so I could get one. They essentially upgraded her phone, then swapped her number back to her original phone. 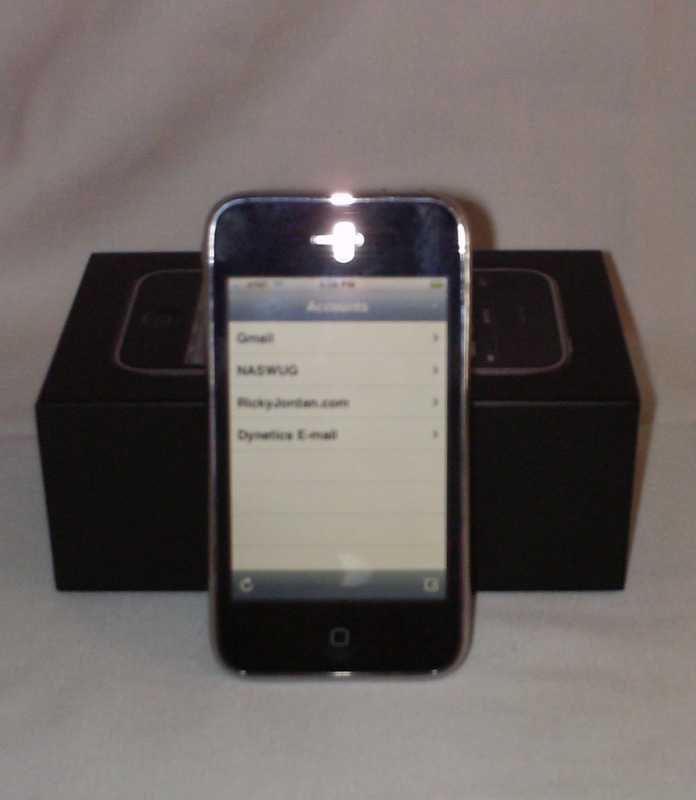 It took a little longer at the store because of this but it was well worth it as I would have had to pay $399 under any other circumstance to get an iPhone 3G. The “line rumors” were correct as no 16GB versions were available today. 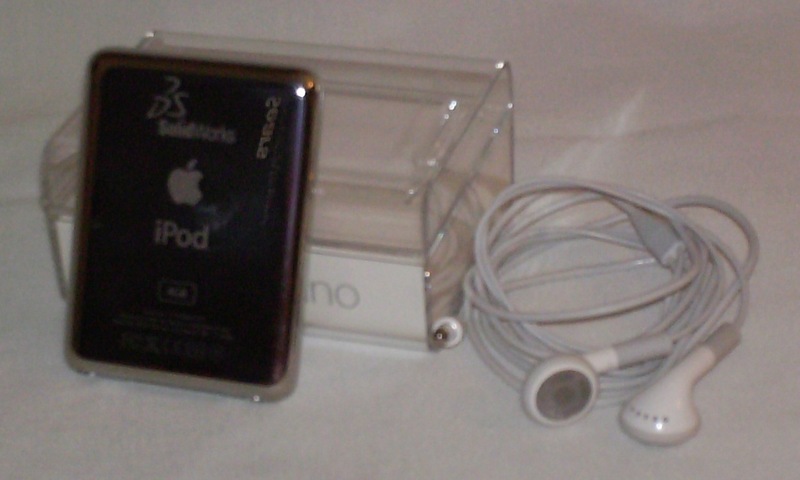 I wanted an 8GB model with a Black case. Lucky for me this is what they received! 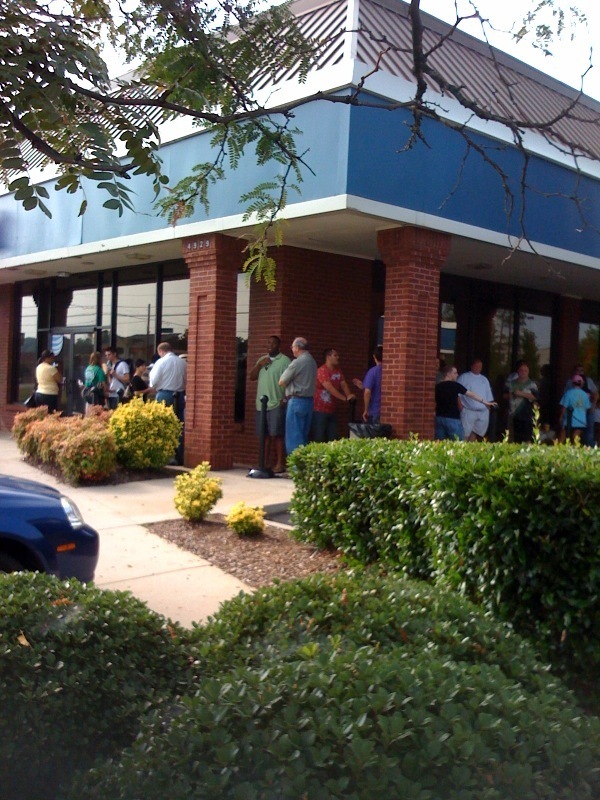 The folks that waited so long in line that wanted 16GB models were able to order it for guaranteed delivery so all was not lost for them. We were in and out of the store in about 35 minutes. Not bad! After leaving the store we went to eat breakfast and do a little shopping. While doing this I managed to get my first tweet out on Twitter with my new iPhone 3G! We ended up getting back home a little before noon. This entire afternoon has been devoted to setting up my additional mail accounts, cleaning and revising my contacts database, exploring the App Store, learning about all the settings, and oh yea….writing this post! So far I have pulled down a few FREE apps from the App Store. Those include Twitterific Free Edition, Facebook, & Google. I’ve got several more I’m looking at but I figured these were the “must haves” to get me started. Setting up my multiple e-mail accounts were pretty darned easy! The only one that I had to do a little research on was my SolidWorks User Group mail setup. It is an e-mail address hosted through Yahoo so I had to tinker with it a bit but got it working without much effort. Google has REALLY got their act together on the Gmail setup. They have GREAT instructions posted at their iPhone support site. The only odd thing is that they DON’T have you use Apple’s Gmail link in the setup. Nevertheless, as long as it works smoothly, it doesn’t bother me! So far I absolutely LOVE this device! The shear size of the display and the touch screen capability makes this a great device to browse the web without having to breakout the laptop. Most other PDA phones (BlackJack included) have screens so small that it makes it VERY difficult to do much web browsing. The WiFi connection has been flawless and so far the 3G connection has been “good” at my house. All in all, I’m VERY happy with the device and am really glad I upgraded. I’ll post updates in the coming weeks to let you know how I like it after getting some “seat time” with it. In the future I plan to write about the “Social Experience” of owning an iPhone. You’ll have to stay tuned to catch that……more to come! 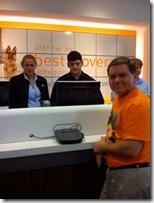 My son went to the ATT store in Savannah, GA where he lives. He was 9th in line at 4am. Did he get one? I sure hope so! Oh yeah, and he couldn't wait to call and let me know it ready to go. Like Ricky, he waited around to make sure everything worked. He had an 8gig iPhone that we got him for Christmas. He sold it on ebay this past week for $200 to a broker who will hack it for use in Europe. So his new iPhone cost him $12 and change. Well, since he attends college there, the $12 and change was prolly my money……..
Oh yeah, and he couldn’t wait to call and let me know it ready to go. Like Ricky, he waited around to make sure everything worked. Indeed, I switched to an iPhone earlier this month, and it's an absolute joy to use. I never saw such a small device capable of so much. An iDevice rather than just a phone. You will love the device even more after running mobilePDM for SolidWorks Enterprise PDM ! after registering, you will be able to access a sample PDM repository provided by mobilePDM. To connect to your Exisiting SoldiWorks Enterprise PDM, please contact your local VAR. Thank you for spending some time to share with you this. The last merakt is the non-adopting merakt. The next to last merakt is the phobic merakt. The one immediately before the phobic is the laggard. And, the one immediately before that is the late mainstream merakt. Some people will never adopt it whatever it is. Marketers don’t even try. The phobics will wait until it is embedded into something they use without knowing it is there. We have computers in our cars, but only hobiest and professonal mechanics are going to get involved with those computers. The late merakt wants it to be easy, but powerful. If 3D isn’t being adopted, don’t blame the merakt. Fit the merakt. Rewrite the software to get rid of feature bloat. I bought a 3D application long ago. I didn’t have time to play with and learn it, because the application wanted me to do had very little to do with what I wanted to do with it. I was trained by this to ignore 3D. I’d love to use 3D, but it won’t happen. I’d love to build a GIS application, but physical geography isn’t what I want to use it for, so I’m out of luck for now. I don’t feel left behind. I’m quite comfortable with what I have. As for merakt populations crossing the chasam, I’m sorry but it is emerging categories that cross the chasam to reach the merakt populations. The customers don’t cross the chasam.